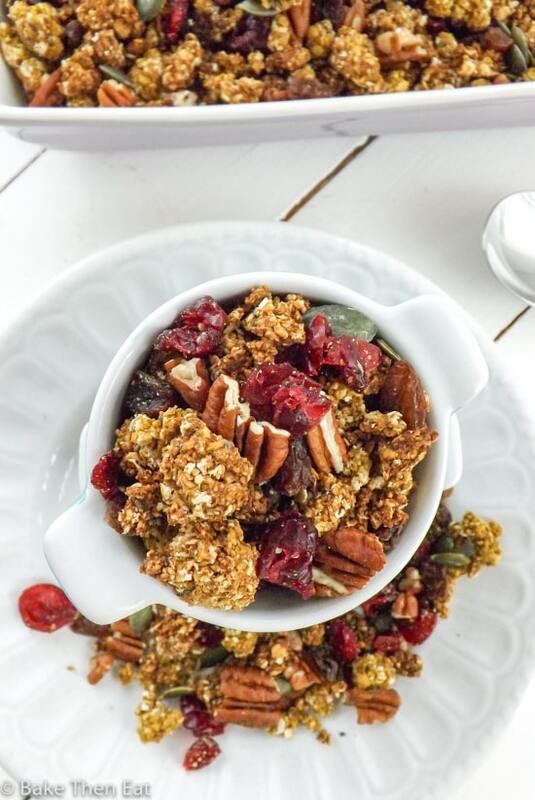 I hadn’t realised it had been so long since I last shared a granola recipe with you guys. I make this stuff all the time in different flavours, but I quite often forget to share. But while I was happily eating a bowl of this Homemade Pumpkin Granola I realised I needed to share this one. 24 hours after making it, my house still smells of pumpkin and cinnamon. Its heavenly! Why buy expensive candles just make this stuff instead. But before I get to far into the hows and whats of this recipe I just wanted to give a shout out to the team over at blogVault. No this is not an affiliate link or a sponsored post but a genuine thank you. I am pretty tech savvy, I can always pretty much solve most technical problems given enough time to be super geeky and research the problem. And I have always known that backing up work is an essential task in this day and age. 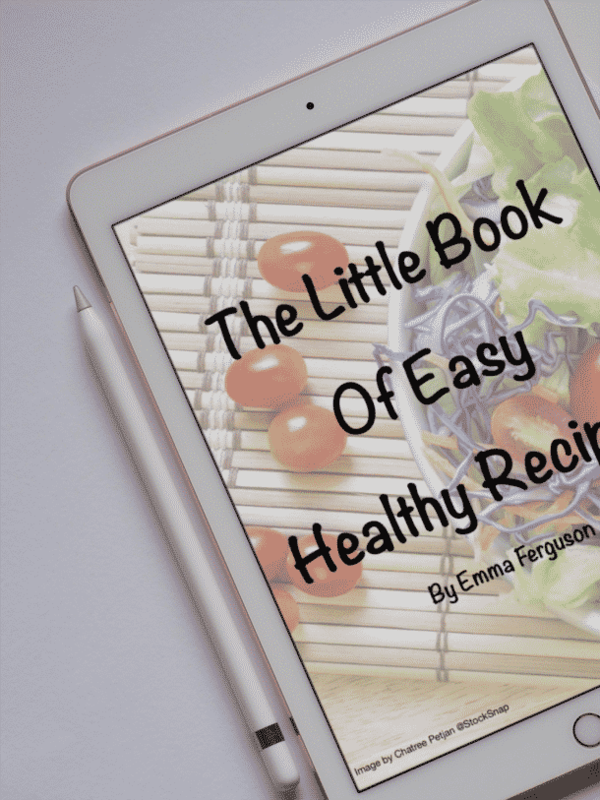 In the first year of my blog I played about with free plugins and had nothing serious in place. Then after a mini scare that I was able to fix I decide to pay for a proper service. OMG thank the Lord I did. Last week I was hacked really badly, almost every file had been corrupted and destroyed. I had in all essence lost my site and 2 years of hard work. 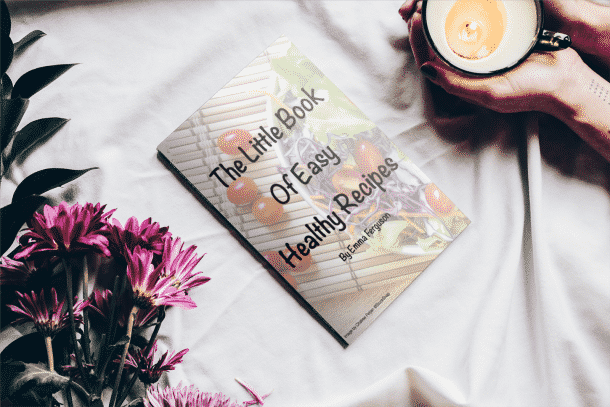 Never believe for a second food blogging is easy or any blogging for that matter. Its fun and challenging yes, but its a lot of hard work and demanding on your time. And I had lost everything, it was all gone. In a panic I contacted my hosting service and they weren’t much help I asked they guys at blogVault to help me out as I was struggling to get my site to restore without error. Bless them, they went into my files and pinpointed the exact date it happened and cleaned everything up. Deleting the corrupted files and folders and restoring my site to what it should be. I tell you now it is the best $89 (approx. £58) I have ever spent. If you run a blog / website of any kind please make sure you have a safe and secure off site backup that is reliable with a good team to help you out. Especially is you are a little weary of technology. If you don’t please do it now I can’t recommend blogVault enough but look around and see what suits you and do it now. Please don’t put it off any longer. Anyway back to the homemade pumpkin granola. This recipe actually came about because I had some left over pumpkin puree that I needed to use up. I don’t know about you but I hate waste, there is just no need for it. Sorry enough preaching. Back to this homemade pumpkin granola, I needed some new granola as I had finished up my previous one a few days earlier so I thought why not mix them and kill two birds with one stone (I would seriously never kill a bird with anything!). But you know what I mean. Autumn is now in full swing in Scotland, its cold and crispy in the morning and its dark by 5pm. Within a few weeks it will be dark by 3.30pm which makes food photography even harder then it already is. Dull days followed by early dark evenings make food photography a real nightmare. You spend all day waiting for that 10 minutes of sunshine praying for it to hit just in the right way. But its not all doom and gloom because Autumn has some of the best flavours of all the seasons. Pumpkin, blackberries, apples, beetroot, figs, kale, cranberries and cabbage to name but a few. Standby for one of the best cabbage and blackberry recipes coming your way soon. 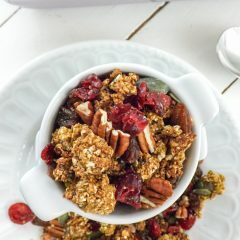 So I wanted to capture a few of those flavours in this granola with the pumpkin and cranberries giving it that lovely Fall feel. It has very little sugar in it just a measly 2 tablespoons, I did try it without the sugar and for me it was just not sweet enough. It also has a small amount of maple syrup in it to help things along. 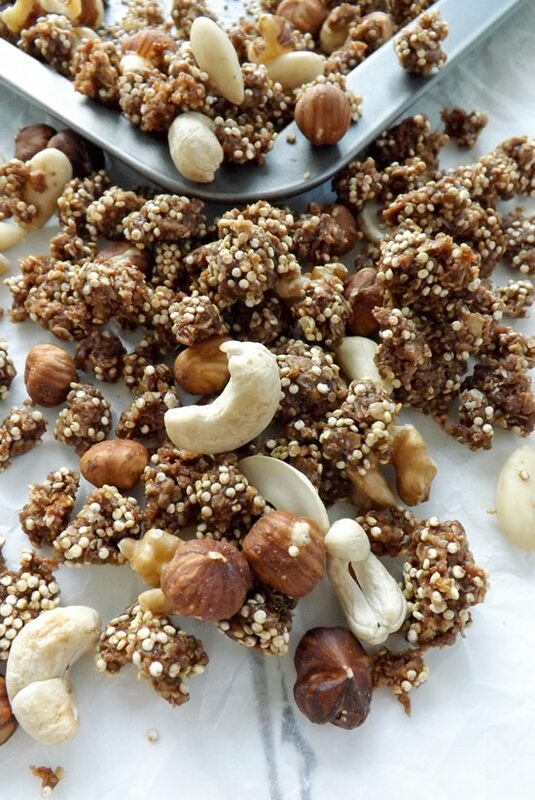 Don’t like pecans – try walnuts or cashews. If you have a nut allergy leave them out all together. Don’t like cranberries – try using dried cherries, coconut or raisins. Not sweet enough – Add in some chocolate chips. Want a little more crunch – Throw in some quinoa before you pop it in the oven. 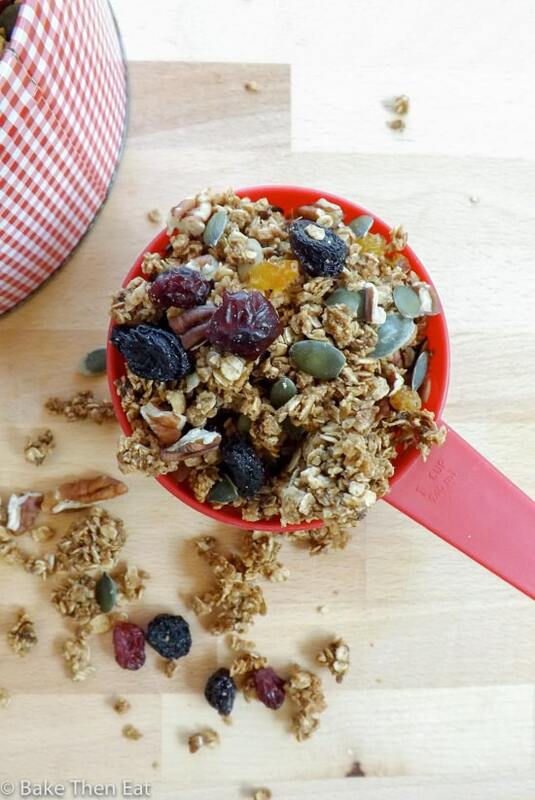 Customising is one of the best things about homemade granola. Add in what you like and take out what you don’t. And its so versatile as well. It’s great served in a bowl with cold milk but it is also a great topping for yogurt and ice cream. Or as a compliment to a fruit salad. Or just in a bowl being eaten as a healthy snack while enjoying The Great British Bake Off followed by Doctor Who on catch up TV. 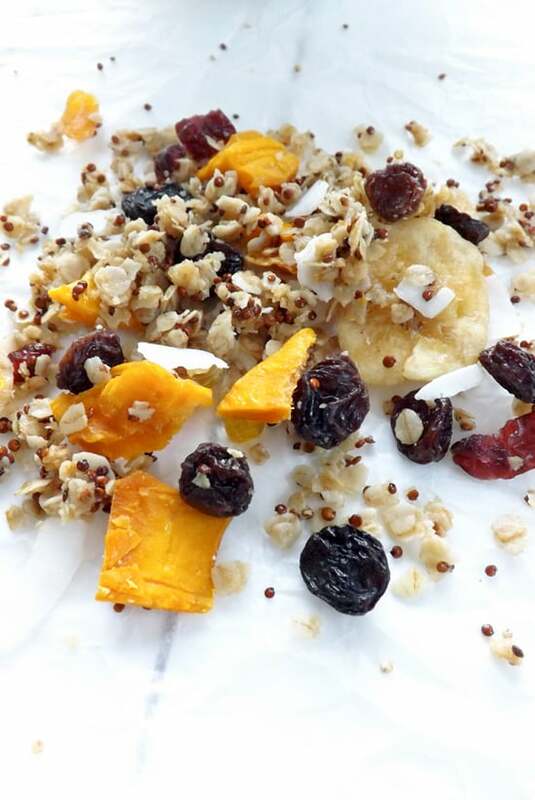 So hopefully you will enjoy this Fall inspired homemade pumpkin granola as much as me. 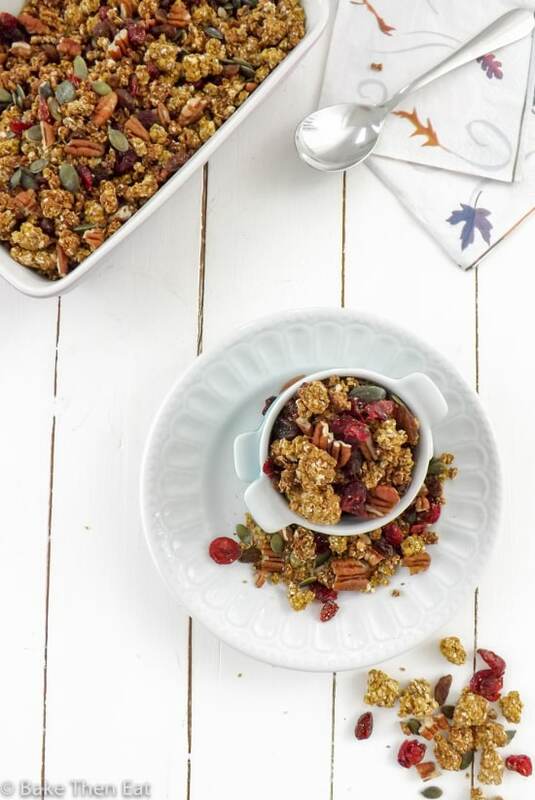 If pumpkin really isn’t your thing then I can highly recommend my Maple Granola instead. But go on give it a go I promise you won’t regret it. 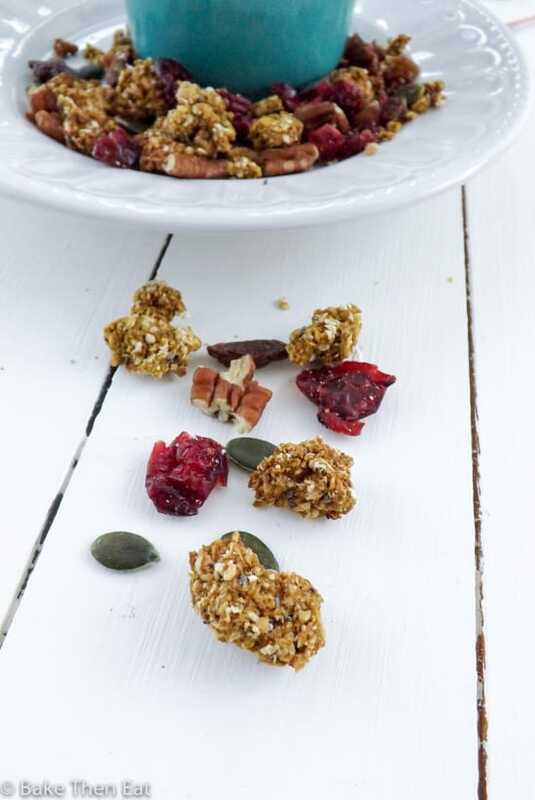 A crunchy homemade pumpkin granola, lightly flavoured with sweet spices and mixed with cranberries, sultanas, pecans and pumpkin seeds. 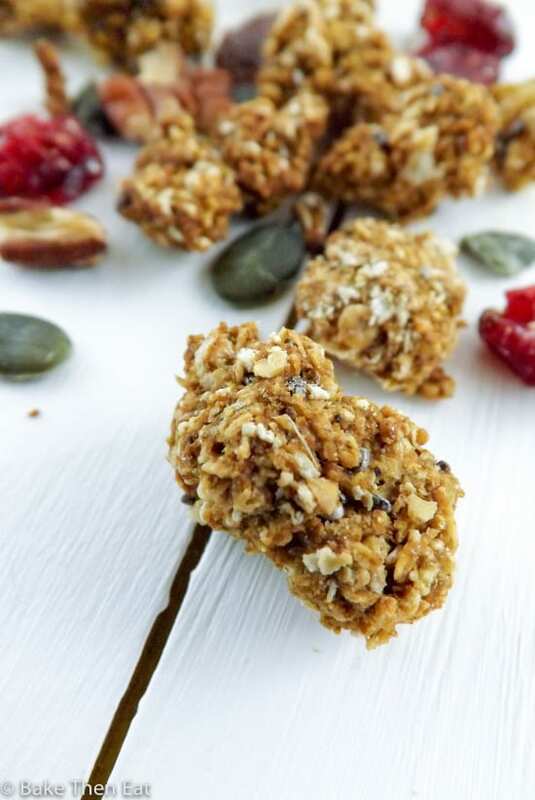 A healthy flavourful breakfast treat. Preheat your oven to 170C / 325F / Gas mark 3 and get 2 large non stick baking sheets out and ready. In a small pan place the coconut oil, pumpkin puree, maple syrup, spices and vanilla extract and very gently heat it until the coconut oil has melted and everything is well mixed in. This should only take about 90 seconds. Take it off the heat as soon as the coconut oil has melted. In a large bowl pour in the rolled oats and chai seeds. Pour the warmed pumpkin mix over the oats and mix until all the oats are completely covered. Sprinkle the light brown sugar over the clumpy mix and give a quick mix in. 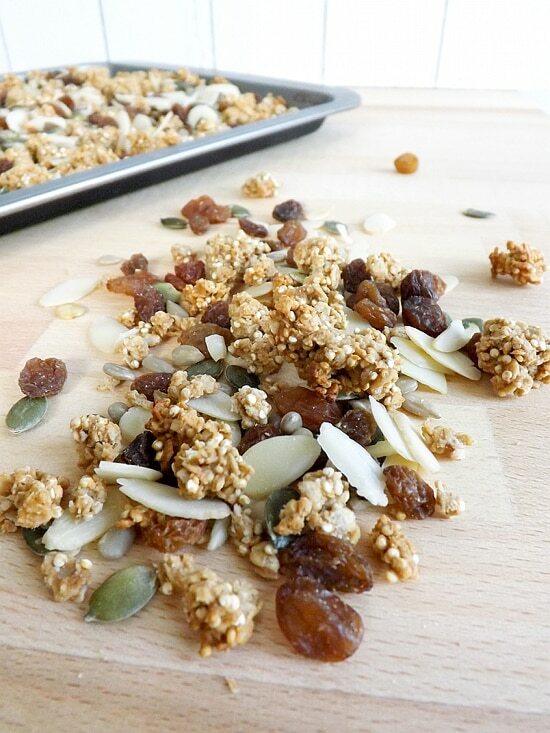 Spread the granola evenly over the two baking sheets allowing it to form little clumps. Pop it in the oven, after 20 minutes give it a little stir and swap the trays around and bake for another 20 minutes. Turn the oven off open the door a crack and allow the oven to fully cool down leaving the granola inside. I leave it in overnight so its perfectly safe to do that. After an hour or in the morning take the granola out of the oven and mix in the pumpkin seeds, roughly chopped pecans and dried cranberries. Kept in an airtight tin this granola will keep for 10 days to 2 weeks but it will start to loose its crush after about 5 days. 1. If you don't have pumpkin pie spice on hand you can use 1 teaspoon of ground cinnamon, 1/4 teaspoon ground nutmeg, 1/4 teaspoon ground ginger, 1/8 teaspoon ground cloves and 1/8 teaspoon ground allspice for the same effect. Yes, why bought expensive one instead of making it yourself at home? Your granola looks really great, Emma. Oh no, sorry to hear that your site got hacked – so scary but glad that blogVault was able to help. 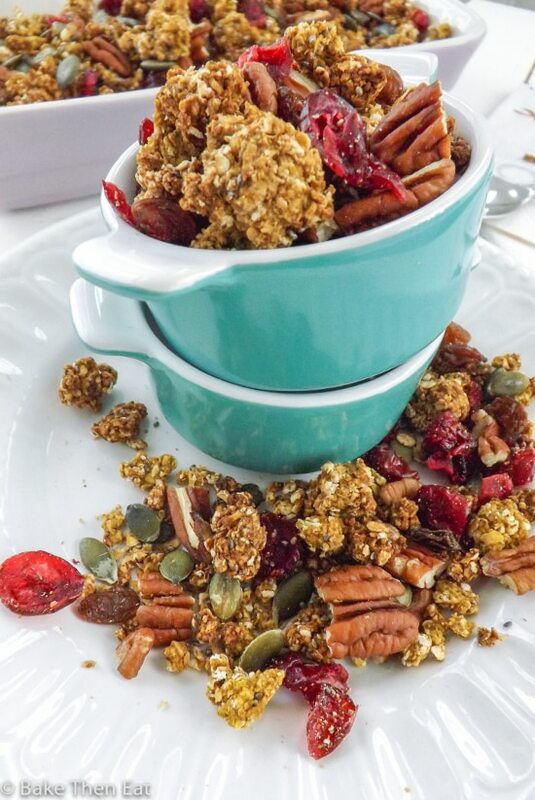 Love everything in this pumpkin granola! It looks delicious and perfect for fall! Delicious as always 🙂 Good to see this here. pumpkin seeds cranberries and coconut oil (x everything makes it so healthy :p another healthy recipe.. superb.